When AP English Language & Composition was introduced in 1980(ish), AP Lit teachers were skeptical. A whole course based on non-fiction? Cake walk. They soon learned the opposite; in so many ways, the course was more challenging than one rooted in fiction. Times changed. When Lang was designed, the vast majority of American high schools were on a “traditional” schedule of 5-7 classes in the course of a day over a span of 180 days. The English universe was based on reading fiction, writing about fiction, experimenting with creative writing, and teaching grammar and usage outside the context of writing. AP Lang was a completely separate entity, what some considered to be an experimental elective. Once it became more accepted and offered in more high schools as a standard course for juniors or seniors, school districts began weaving state standards into the course. In my school district, the class was known as AP English 11 and then AP English III. I was to teach as survey of American literature as well as the College Board skill set. This layering of curricula became the standard, but it was not the original design of AP English Language & Composition. In the mid 1990s, block scheduling started trending, and it was designed for struggling students who needed the opportunity for credit recovery after failing a course. In my district, a block course now gives a teacher 30 fewer hours with students. That won’t work too well if that teacher tries to layer the curricula of a literature survey on top of AP Lang standards. I’ve taught the course on two schedules. I started out with 180 days of 50-minute class periods with 32 students in each class. The high school was large (1900 students), and had five sections. These kids were in an inclusive program, but there were some serious high flyers, and my students’ pass rate stayed between 62% and 65%, right at the exam average. I switched schools (to a tiny mill-town Title I middle college) and learned that there were no AP classes at all. My third year there, to work within a standard 4×4 block of 90-minute classes, the APUSH teacher and I developed a plan to run both courses on an A day/B day schedule. We only had twelve students that first year, and four of them were ELL. They all struggled academically and had come from a feeder middle school that did not assign homework, but my co-teacher and I saw SO MUCH POTENTIAL in these students and decided to give it a go. It was glorious to watch students who had never been intellectually challenged stretch, wake up, and devour the material we gave them. Our principal made it clear: I don’t care about your scores. I care about pushing students who have never been pushed before. It was all about growth mindset for him. It’s a good thing that he had no expectations there, lemme tell ya. Not pretty. Not one single student scored a 3 or above on the exam. To a student, the ones who went to college came back to tell me that they blew their freshman comp classes out of the water, that other students came to them for writing help. The next year, we had better scores, and the next year, a bit better, and so on. Growth, growth, growth. Year-round, every-day, 90-minute block. Shangri-La can indeed be found in some districts. There has to be a willingness to sacrifice an elective, but in some cases, schools pull it off by offering a writing class first semester and then moving those exact same students right into AP Lang with the same teacher. A course with this design can be inclusive because the teacher has time to develop writing and reading skills. Year-round, every-day, 50-minute classes. Some schools do this with what is called a modified block schedule and split two classes for the whole year. It takes some creative work with the scheduling matrix, but it can be done. A Day/B Day 90-minute classes with flexibility. If the APUSH teacher wants to give a mock exam, the AP Lang teacher gives up the students and vice versa. If the AP Lang teacher needs to be out of school, instead of leaving the students with a sub, the APUSH teacher takes them. First semester 90-minute AP Lang with regular, scheduled review second semester. Students who will actually come back to the review sessions have to be placed into this class, so these kids may be the cream of the crop. Begin with an overview of the exam and a blueprint of the semester. Move to rhetorical analysis with a focus on exposure to each of the modes. Students should be be reading each and writing within each and using each mode as a strategy within another mode. Move to argumentation and persuasion. As a culmination to this unit, students write and deliver a relatively short persuasive speech, the text of which includes parenthetical citation and a works cited page (MLA). Follow with the synthesis essay, which is a logical next step from argumentation and the research process since students are basically writing a researched argument for Question 1 of the exam. There’s just no way to spend precious time on whole-class novels, so a structured independent reading system might be a way to get in some fiction. 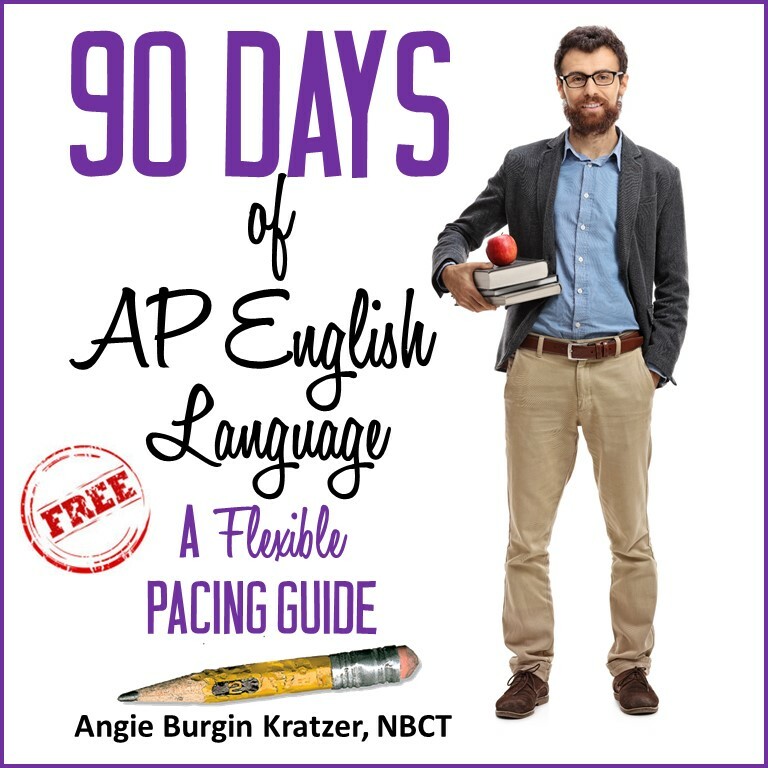 If you’re new to AP Lang and want a bit more guidance, I’ll send you a 90-day pacing guide or a 180-day pacing guide for free. FREEBIE! Get this 90-day pacing guide right in your inbox when you join my mailing list. No strings!